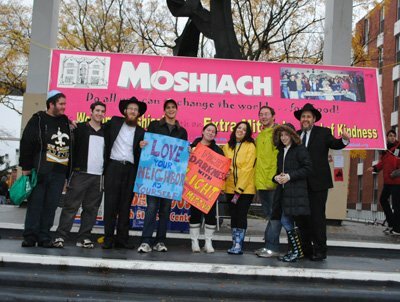 On Wednesday, October 28, 2009, hundreds of students from all walks of life participated in the "Bring Moshiach - Do a Mitzvah Campaign", at the Chabad House stand on the steps of Brower Commons on College Avenue in New Brunswick. In response to the message of divisiveness and hatred imported to the campus by a group from Kansas, the Chabad rabbis and student volunteers encouraged the campus men and women to counteract with increasing in acts of kindess, goodness, and Mitzvahs. For photo gallery click here.